We have had THE BEST WEEKEND. Friday was my husband’s last day at work for two whole months, and we decided to kick-off his time at home with a baby-free weekend. The first and last for a long time, presumably. Little A spent the whole weekend with his grandparents, and we slept as long as we wanted, ate all our meals out at restaurants, had long uninterrupted conversations, and got a million little things done. We cleared out all the junk that had piled up in the new nursery, I sewed covers for all the cushions in Little A’s room along with some new bedding sets for his crib and even did a couple of other little DIY projects. The apartment feels lighter and more organized and livable and we feel fantastic. And we finally bought a new sofa. After a lot of back and forth about what to buy, we end up deciding that the single most important factor for us when making the choice was that we needed a sofa with completely removable and machine-washable cover. I wanted a light-colored sofa to keep things light and bright in our living room. But I don’t want to be constantly uptight about our children (or visiting children) climbing on it. 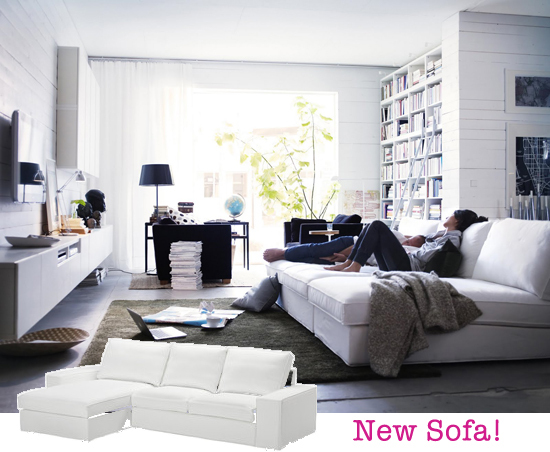 So in the end it had to be an IKEA sofa and we settled on a Kivik with a chaise.